It’s been another sweltering day in my city and I could barely crank up the energy to go to the little art exhibit in the park down the street, much as I wanted to. And although I’d really really like to cook something fabulous, that is proving to be a bit of a challenge in this heat. Reconnect with your organic farmer – the produce is looking lovely these days and if you have a chance to get them direct from the source I highly recommend it. I find that the flavor of organic vegetables is always so much more vibrant than their dull supermarket cousins. Of course, it goes without saying that avoiding icky chemicals in our food is my main motivation, especially for the little one. It’s better for our planet too. And I like supporting small farmers…they rock and I want them to stick around! This salad was made with my organic farmer’s talbos kamote (sweet potato leaves), tomatoes, and young native onions. Don’t sweat the small stuff – When even the tiniest movements seem to make beads of sweat form, you don’t need any extra provocation. Heat saps your energy – now is not the time to be worrying about the fluctuation in your internet or your housekeeper leaving. Save that blog post on Word and cozy up with an amazing Sci-fi novel. Call out for pizza. Press pause and be thankful for the things that really count. Update: More about refrigerator pickles over at The Kitchen! In my country we call this chow and it as always the thing to have on hand. Delicious. I was just thinking about you the other day Joey, after reading your post on Kamote tops salad…and while eating my iceberg lettuce drizzled with my Apple Sesame dressing in the height of winter here. Try this dressing, Joey, and you will find yourself eating iceberg lettuce even if it isn't your favorite lettuce! I will e-mail it to you for I do not want to hog the space. Oh, here is another trick I use when I make refrigerator pickles as well…add a few splashes or squirts of Kikkoman toyo…umami-ish! Thanks for the post! These pickles look like they'd make a great snack to come home to or a tasty side dish with any lunch! 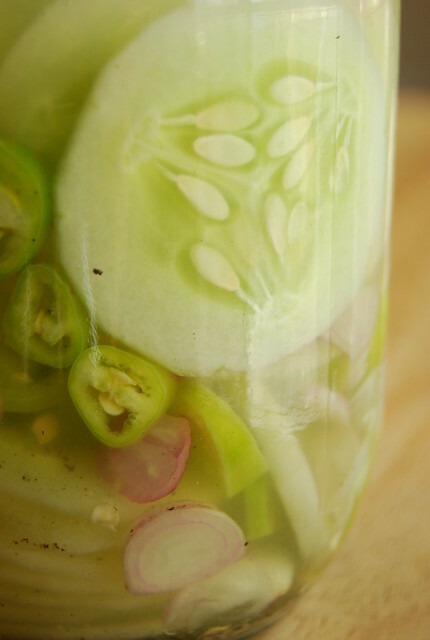 And cucumber pickles go soooo well with roasted meats – even store-bought ones! Hi Michelle! So true! 🙂 The art of doing nothing…a lost art and underappreciated! Hi Miri! They do make a nice side dish…but I must warn you, they make me eat more than I plan! Yummy! I've never tried to make pickles before. Thanks for posting! Seeing all these mangoes now I've been thinking of pickling as well, what a coincidence! Pickled green mangoes…noice. Refridgerator pickes are so easy and a great way to add flavor to a dish! I am new to your blog and really like the design. Will return. Hi Anonymous Paul! I’ve been seeing a lot of the small green mangoes too…these are awesome pickled!